Market Samurai is an innovatively designed software product, equipped with advanced research tools, which make it easier for the webmasters, or even novice SEO executives, to carry out research, analyze web content, and select the keywords vital for attractive huge traffic to the website. Market Samurai, through its cutting edge research and analysis tools, guides webmasters to get a sense of the relevant keywords users search on various search engines like Google, Bing etc. These resources and tools of Market Samurai help them to get accurate and reliable reports on keyword research, ranking of websites on search engine result pages (SERP), creation, publication of content and much more. The primary function of Market Samurai lies in keyword research. So, when you search by putting in any keyword like “best keyword research” it will generate millions of results along with relevant search report covering SEO analysis Score, searching data, counting of title tags, density etc. among others. All comprehensive information regarding Market Samurai is available at its official website. Information regarding its features, prices and how each of the tools of Market Samurai is helpful for you is explained in simple and lucid language. So, what are you waiting for? Log in at www.marketsamurai.com to download free version of Market Samurai. Market Samurai has been developed by a leading IT company, Noble Samurai, which has major interests in developing a full range of elements for marketing research processes. It delivers accurate and genuine information to the online marketers through its innovative software applications like Market Samurai. 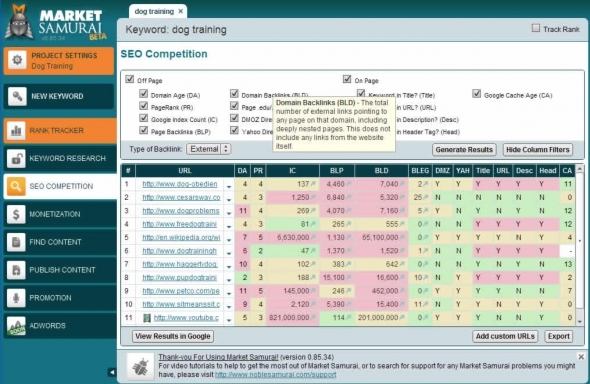 Market Samurai keyword research tool is the brain child of Eugene Ware, Co founder of Noble Samurai. Eugene has a wide experience of various aspects of software coding and front line driving. He is the lead man for conceptualization and execution at Noble Samurai. Dr. Fernando has his vital role in dealing with all aspects of Training Dojo. He is a resident doctor and is considered to be the keystone of training team. Anthony puts in his best efforts in order to take SEO technology to masses. Arlen is the youngest member at the working board of Noble Samurai. Arlen has a high degree of acumen in coding and is considered to be a child genius. He deals with various aspects, and coding in particular, of Market Samurai. • The best thing about market samurai is that it is a desktop based application and it does not need a browser. So, you don’t need to depend on a browser each time. • Its highly admired aspect by its users worldwide is that it doesn’t suggest you to waste your time on those tasks which will not deliver the best results. It, thus, lets you to focus only on those areas which get you best results for unique internet marketing. • It has clarity and transparency in the reports of keyword research so that you are clear in your objectives and you are not confused by confused information. • With Market Samurai Keyword research tool, the webmasters are empowered with executing tasks easily and effectively so that you receive better results than ever. • It provides comprehensive keyword research report analyzing all vital aspects like market competition, search engine optimization and pay-per-click advertisement. • You get to use the bonus tools for carrying out article research, social media research as well as analyzing minor and major aspects of affiliate program. One has to do a vigorous research in order to know the details about its cons. Nonetheless there exists a few concerns as some people say about its complexity. They would generally say that a few people would complain of its slow working speed. Another shortcoming is that in its research reports Market Samurai does not show data as well as statistics. It is going to tell you which are best keywords you should go after. The webmasters have to take pain to decide it on their own. Market Samurai’s strength lies in keyword research. Its module is yet another user interface which is suitable for Google Keyword research tool. It represents the accurate figures for a particular month or for a specific time period, say, a day besides providing all vital information pertaining to Google searches for a single keyword or a phrase. You can shortlist the most beneficial keywords for you by specifying the criteria as per your own requirement. With this tool, you can check out the prevailing competition among a few keywords. This tool will return you the top ten search results that you are going to get in Google. The best part is that it presents the research report after in-depth analysis of various websites. The results are quite useful in determining as to what extent web pages are optimized. You can also analyze the number as well as nature of the backlink embedded in the web pages. It also gets the webmasters sense of its worth to determine whether a particular link is suitable to compete for the first page result. • Specify Domain: You first need to click on add domains and at least one domain name should be entered to check ranking. • Specify Keywords: After clicking on “Add Keywords” you should enter the keywords for which you wish to know the ranking of domain you specified in first step. • Get Result: As soon as you click on Update Rank Data it will show the results. Market Samurai works for turning traffic into the potential buyers with affiliate advertisements which are published directly to your website. It lets you to get sufficient articles for research thus, you can find (or write) and publish the content on your blog immediately. You can create high level backlinks for improving your site rankings. You can contact the helpdesk with your problem and question and you will receive prompt response. Having any issue with Market Samurai? Market Samurai maintains an ‘Issues Register’ where relevant issues pertaining to its usability, feature, pricing and such other technical issues are registered along with their prospective solutions. You can search the issues and find answers thereof in the same register. Further, new issues or problems being witnessed by Market Samurai users can also be registered herein. This feature is helpful for those who wish to get answers of commonly asked questions about various products delivered by Noble Samurai, including Market Samurai. At the forum of Market Samurai users from different part of the world share their experience and issues which they might be facing. Many of the people facing similar issues can seek help on various issues from communities that use Market Samurai. Market Samurai carries out analysis of the chosen keyword and sorts out the words which are not apt for driving traffic. It also sorts out those words for which competition is steep. Besides this, there are a few other values which are analyzed by Market Samurai which helps you to track the keywords most related to the website content. It takes just a little time and you are provided with instant information regarding your most preferred keyword. Market Samurai lets you know the topmost ten websites on which your keyword is ranked on. Further it would notify if the keyword has been included in title, tag, meta-description or header, or in URL of the websites. It delivers you accurate information pertaining to that of Google page ranking, backlinks through which you decide the keyword for getting more ranks. Want to know domain ranks? Well that is natural when you wish to see the performance of your website. Market Samurai does is easily for you. It tracks the domain ranking on search engine for the ‘Keyword’ which you decided to use. Well, it has affordable price ranges. It offers its services in different packages so that even those having low budget are comfortable with. If you wish to purchase Market Samurai in the next few days you can get it for your lifetime for just $149. If you wish to get full access to its advanced tools, its Full Version has added advantages that you can avail by paying a one time payment of $249. • Google Keywords Tool etc. among others. Market Samurai has an edge over its peers in many areas. It has in-built features like “Find Content” and “Publish Content” which lets the webmasters find the relevant content integrated with particular keywords. Market Samurai presents the clear picture of the website performance vis-à-vis your peers. In all respect, it tells you the full information (All based on statistics and data representation form.). It is because of the SEO Competition feature that all the other Keyword Research software producers seem to be standing in the second line only. Market Samurai Rank Tracker is equipped with 3 advanced features of Human Emulation, Proxy Rotation and User Agents. All these tools make the queries look natural and it works well with other search engines as well like Google, Bing or Yahoo! Rank tracker checks rank for each page for a particular keyword as shown on SERPs. SEO Power Suite may do it slowly. Yet another advanced tool which sets Market Samurai apart from others is Dojo tool. Dojo makes it possible to present the information in video format as well as in image formats so there is no confusion at all. You will find all vital information like Market Samurai Installation process, Monetization Module, Domains Module, Promotion Module, Find Content Module etc. among others. Features like Dojo are not available in any other similar software tool like SEO Power Suite. So, if you wish to get your website on the top pages in search results, Market Samurai is the powerful tool for your website and SEO Department. The bottom line is that you save your time by keeping away from doing those steps which are not useful and Market Samurai tells you the exact strategies to be adopted so that your website is ranked on the top pages. Considering upon its advantages and ease of use, Market Samurai can be opted as the best keyword analysis tool. With Market Samurai, you are free to receive keyword research tools which really help you in getting effective tools to make your website figure in the top page searches. Market Samurai SEO Software is the most recommended tool that you can have. If you wish to get in-depth, accurate and prompt analysis for vital keywords. Whatever tactics or strategies you opt for publishing and optimizing web pages, the main objective is to get higher ranking and huge traffic. Market Samurai does it everything for you whatever it takes. When you choose to invest in Market Samurai software you can be sure of getting the maximum return on every front of optimizing web pages. Right from searching the right keyword to sensing competition it does it all for you. Content written on well researched keywords attract more audience. Market Samurai tells you the trick how you can enhance ranking of your website. Further it is easier for you to keep a watch on Competitors link building strategies, monetizing the potential of your website and much more. So with Market Samurai you can expect the best returns in huge traffic routed to your website. Your earnings increase considerably when a chunk of this traffic is converted into the potential buyers. It directly tells you the ways by which you can monetize the potential of your website. You can avail discounts up to $52 ranging up to 35%. Further, you can also sign for its free version before you purchase it in actual. The free version has seven days validity. You can use Market Samurai Promo Code which lets you to get discounts up to 35%.